One-Pot Sausage and Mushroom Pasta – This one-pot pasta dish is perfect for a quick and easy for dinner with even quicker clean up! I am also giving you my favorite ratio of liquid to pasta to achieve the perfect one-pot pasta! This one is a keeper! We have always loved one-pot dishes because they make dinner and clean up so quick and easy. The very first time I ever tried a one-pot pasta dish, I was shocked at how easy it was, but the dish wasn’t that great. The pasta was a little dry and not much flavor. With testing many recipes over and over again, I can officially say I know how to make one-pot pasta dishes not dry, how to add just enough liquid to make the sauce hug all of the pasta, and how to boost the flavor. It’s the easiest trick ever, trust me! Before I get into sharing the ratio of pasta to liquid, let’s chat about this one-pot sausage and mushroom pasta for a quick second. 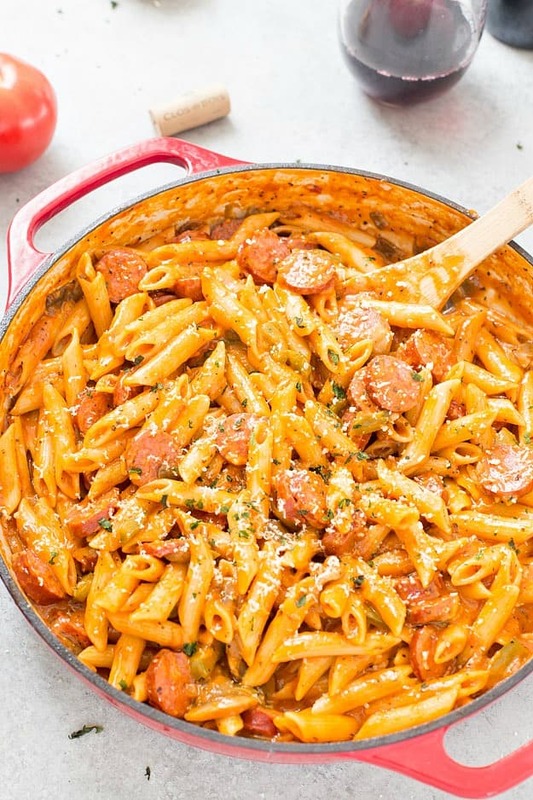 The sausage and pasta are truly the stars of this dish. 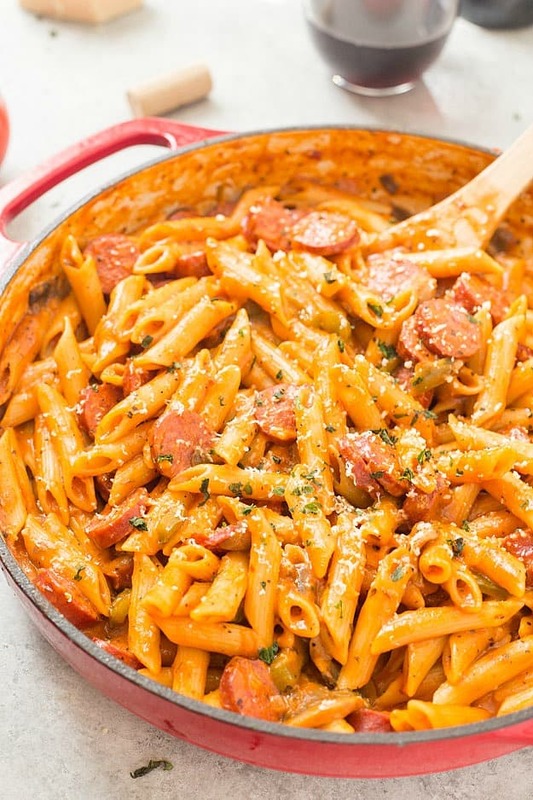 The flavor the sausage adds is tremendous in a pasta dish, and especially in a one-pot pasta dish. 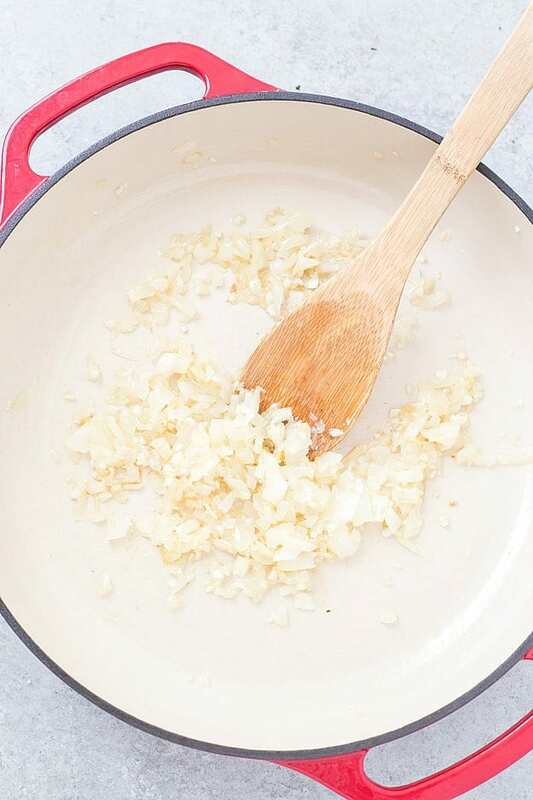 The base of this pasta is diced onions being sauteed until translucent and fresh minced garlic. So simple, but incredibly important components. I know you’ve been waiting for this! When I make one-pot pasta dishes, I always try to quick to this generic ratio of 2 ounces of pasta to 1 cup of liquid with a ratio of 2:1. You will have enough liquid to make the pasta tender without it being too much liquid. For this recipe, I used 8 ounces of penne pasta, so I used 4 cups of stock. As you will see in the recipe, I also added marinara sauce which throws the ratio of liquid of by a little bit; it’s okay because it means there’s more sauce! It’s not more liquid, just more sauce – hope that makes sense! It’s perfect if you would like to add a piece of toasted, buttered bread to soak up the sauce. Oh, my! I have a confession to make. I’m very picky about pasta, and I’m pretty local to my favorite brand – Barilla. It’s always easy to find and did you know it’s the #1 pasta choice of Italy? 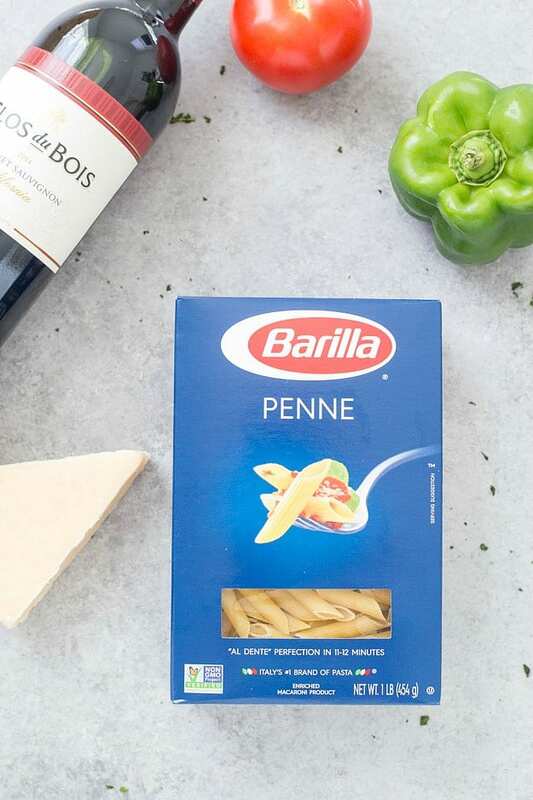 I love how every Barilla product uses high-quality ingredients, they are great tasting, and simple (my favorite)! Don’t forget to purchase Barilla marinara sauce when you are making this recipe for dinner. 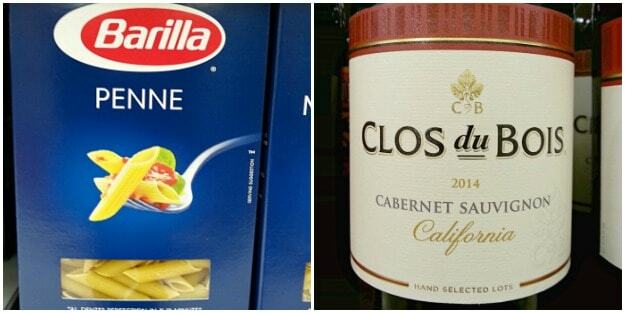 I don’t know about you, but I always try to pair wine with all of my pasta dishes. I always love a glass of wine with dinner, especially when it’s a meal coated with a creamy tomato sauce. The wine I paired with this one-pot sausage and mushroom pasta is Clos du Bois Cabernet. It’s a great medium bodied wine and fruit forward with balanced oak character. Clos du Bois is a great selection of premium wines! So invite your friends and family over for a delicious potluck holiday meal this year! Even better if it’s a one-pot potluck party! Make dinner the talk of the table. One-Pot Sausage and Mushroom Pasta - This one-pot pasta dish is perfect for a quick and easy for dinner with even quicker clean up! I am also giving you my favorite ratio of liquid to pasta to achieve the perfect one-pot pasta! This one is a keeper! Place the oil and onions in a large pot and sautee until the onions are translucent or 5 minutes. Add the garlic and saute for another 1-2 minutes or medium heat. 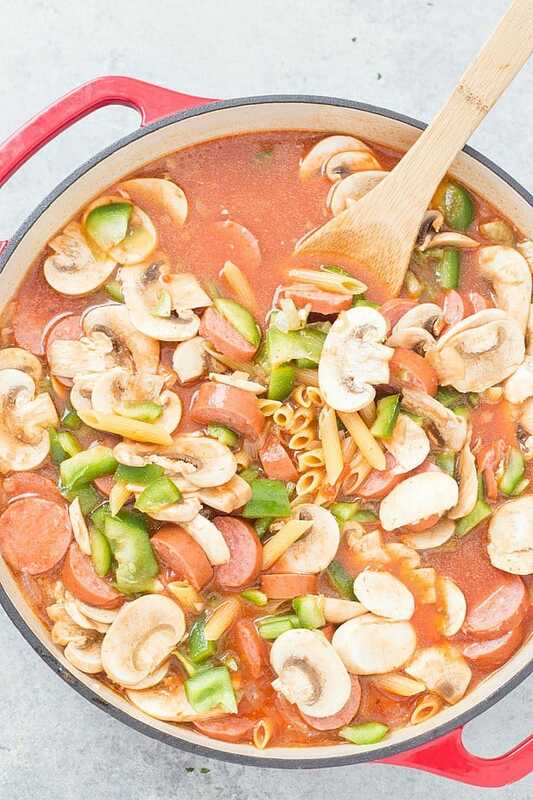 Place the mushrooms, bell pepper, smoked sausage, penne pasta, stock, marinara sauce, crushed red pepper flakes, oregano, and basil into the pot and stir until combined. Allow the mixture to simmer over medium heat for 20-25 minutes or until the pasta is tender and the sauce has reduced. Serve and garnish with fresh parmesan cheese and basil. (Note 1) - I purchased all cooked smoked sausage. (Note 2) - Remember to add the parmesan cheese before adding salt. Parmesan cheese is salty to begin with so make sure to season after adding the cheese. Check out these recipes for even more inspiration! I made this with 12 oz. of Barilla gluten free penne, it was SO good!